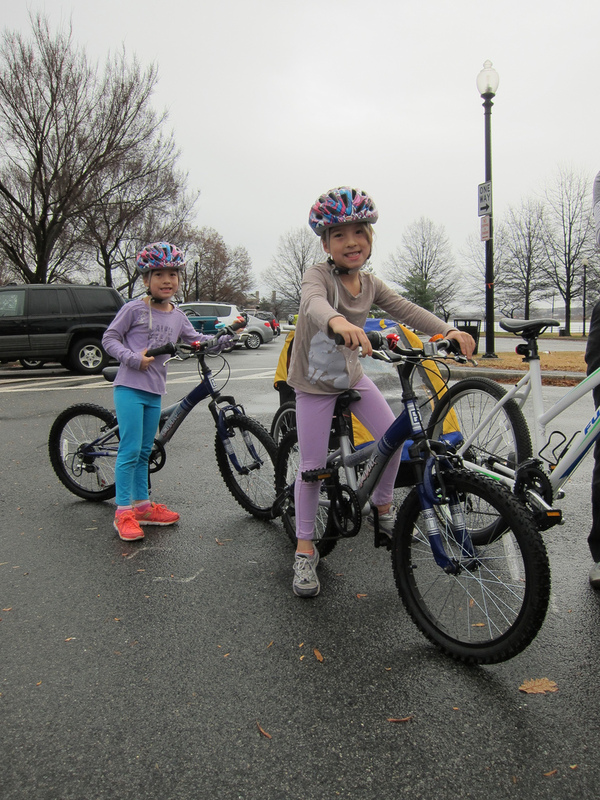 For the second consecutive year Megan, an active member of the #BikeDC community, hosted the Hains Point 100 to raise money and awareness for the Washington Area Bicyclist Association’s (WABA) Women & Bicycles Program. I believe Megan is on the far left. John R on right. 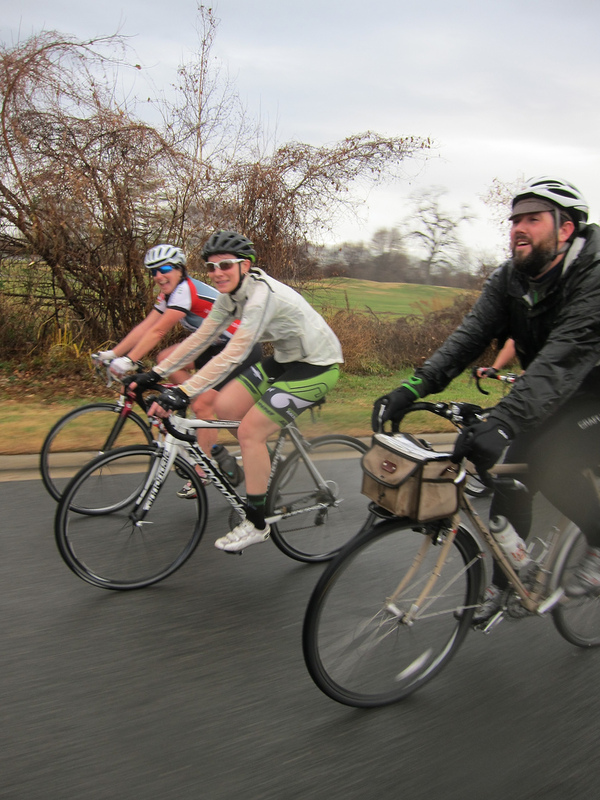 What is the Hains Point 100? 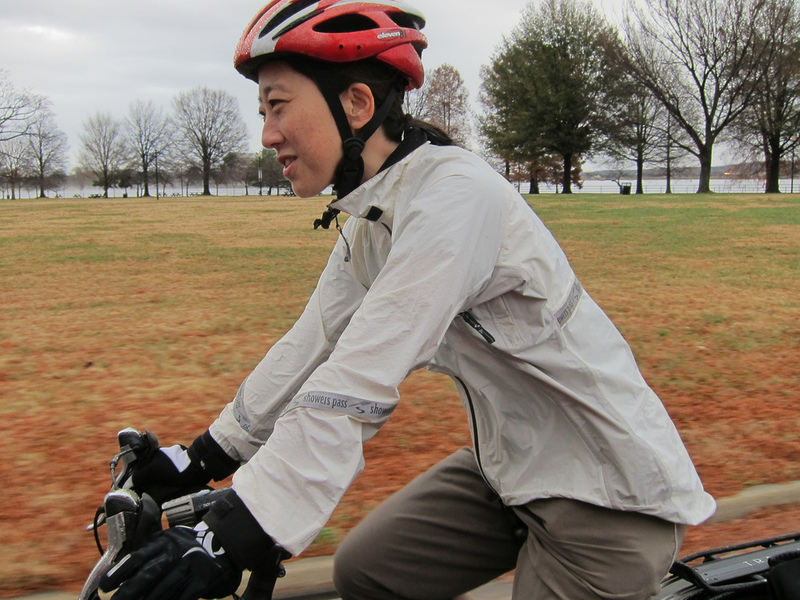 It’s a 100-mile bike ride on the 3.2-mile flat loop of land that is Hains Point. I don’t know how many loops that turns out to be in the end, but let’s just say it’s as much a mental challenge as it is a physical one. 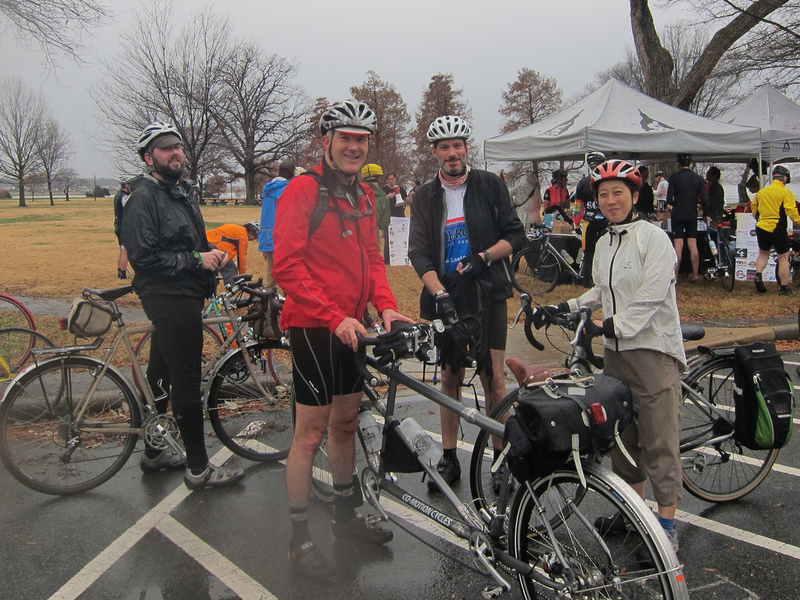 Felkerino and I joined the action for a while, as we wanted to support the event and say hello to our #BikeDC buddies. The day was overcast and sometimes rainy, but overall temperatures were quite pleasant if you kept moving. In addition, an eerie fog rolled in early in the ride to give the event some ambience. It was pretty cool to look out over the Potomac and see the fog hovering over the river. 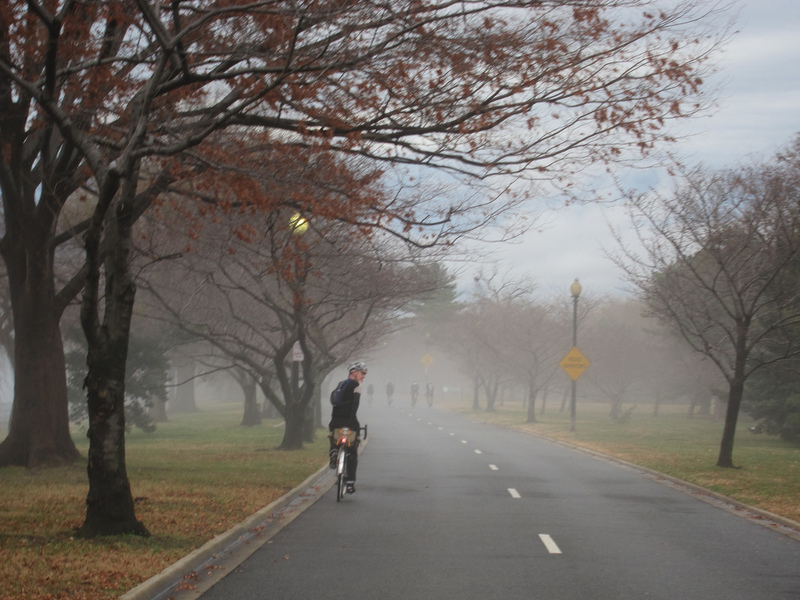 During the afternoon the low-lying clouds also encroached onto the western side of Hains Point, making me feel like after the ride I should go home and read Edgar Allen Poe stories. I did not actually do this; I wrote this post instead. Felkerino and I arrived on tandem, rode a few laps with the morning gang, pedaled home to swap out for our single-speed single bikes, went to lunch at Teaism with our friend Lisa, drank lattes at The Coffee Bar, and returned for another couple of laps to complete our Hains Point-centric outing. 34 miles for the day, and two bikes used per person. Ride ’em if you got ’em. 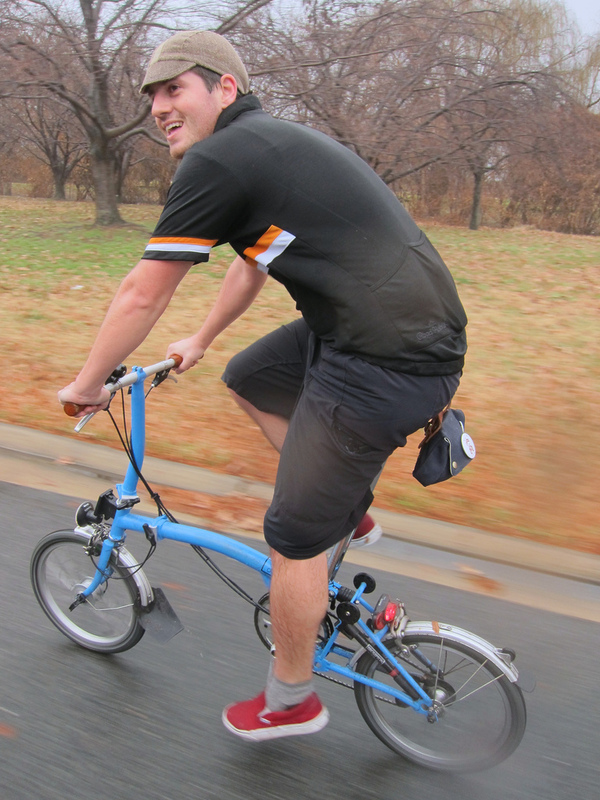 Pedaling along with @sharrowsDC on his Brompton. 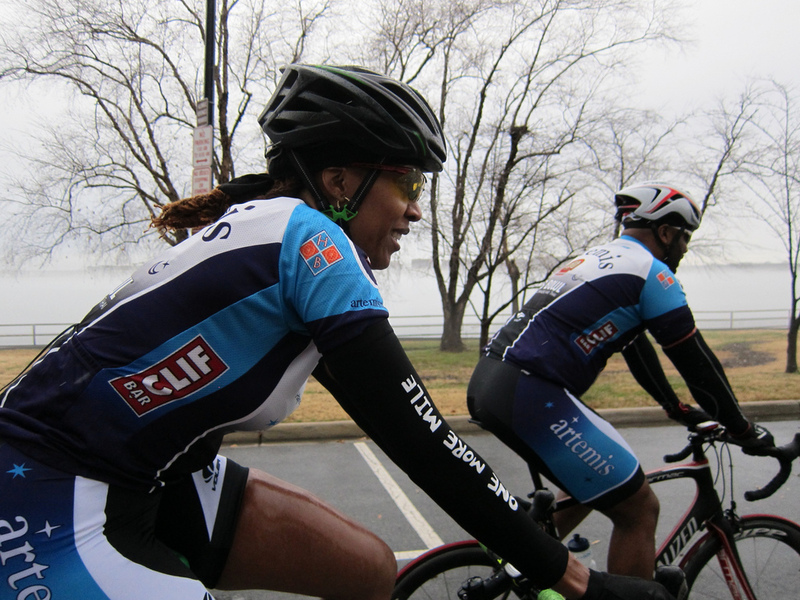 While Megan bills the Hains Point 100 as a century, she encourages people to ride whatever distance they desire. I can see this becoming an annual event. 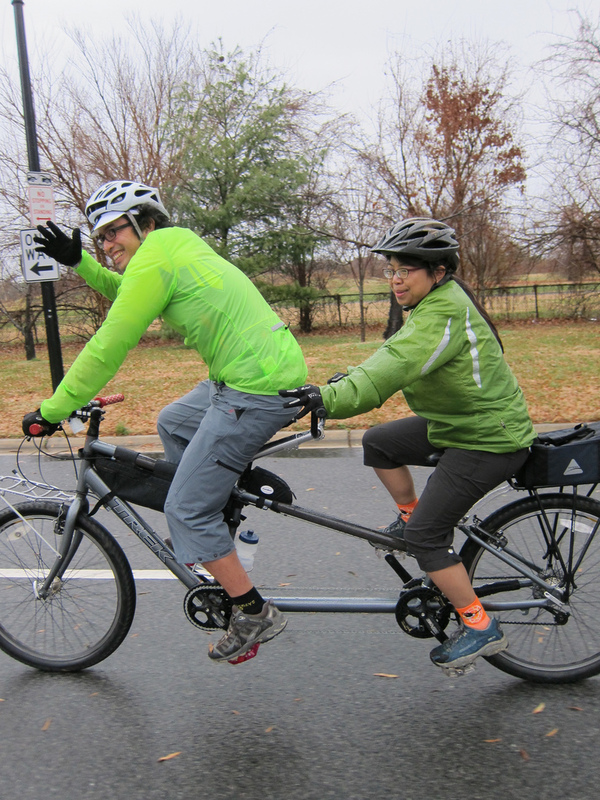 It’s a great excuse to get together with others in the BikeDC community. 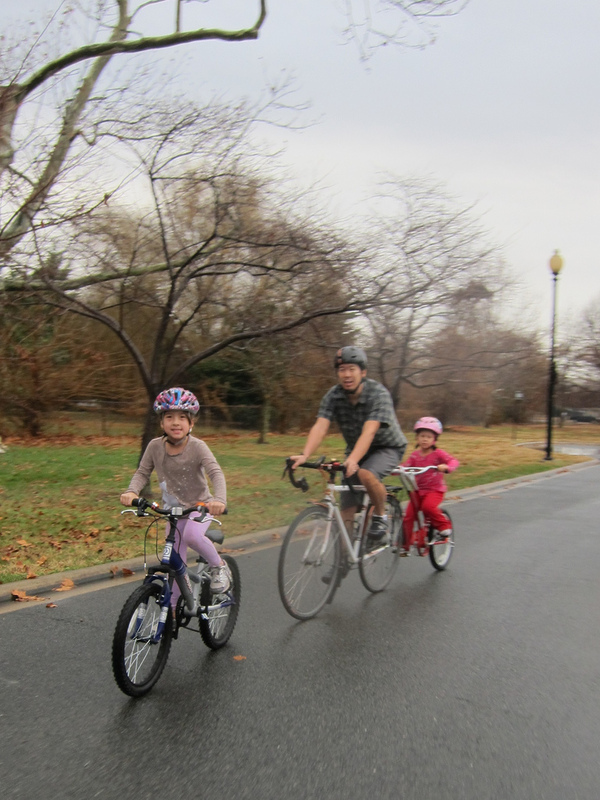 Kids come out and ride bikes with their parents. Riders can choose to go long or complete whatever distance is comfortable for them. 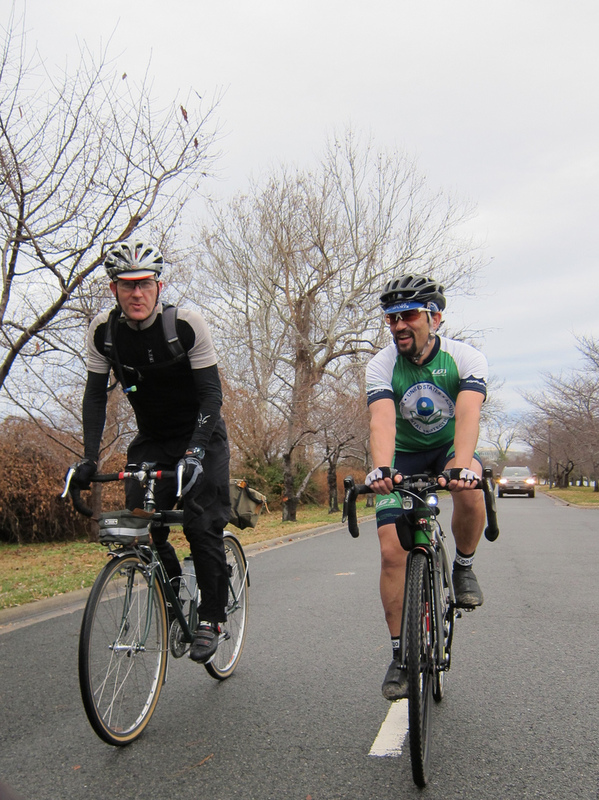 We tailor the Hains Point 100 into whatever distance works for us. It doesn’t matter if you are fast or slow. You can only get lapped; no one can truly ride away from you. Felkerino and Ricky A. Ricky rode a century. We rode 34 miles. 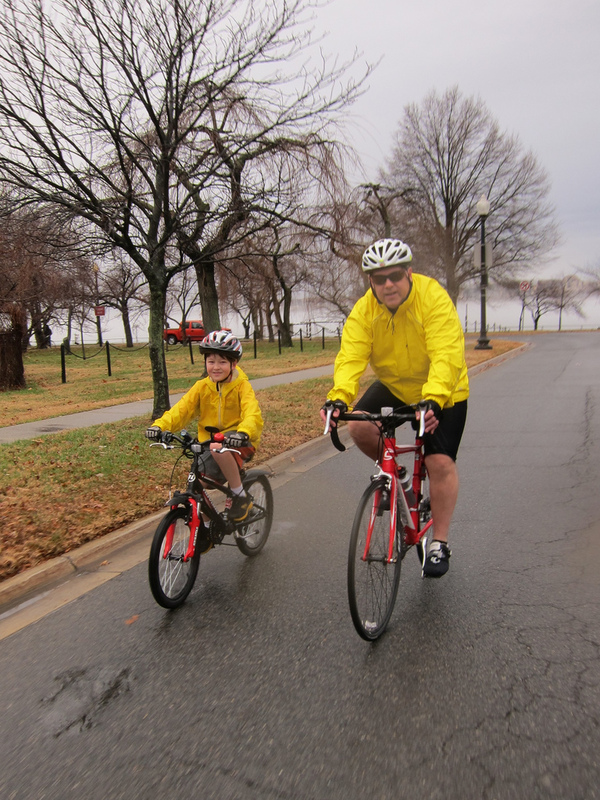 Given that the event occurs so close to the holidays, it’s pretty mellow on Hains Point and there is not much traffic going by. A perfect time to fill the road with cyclists riding for a good cause. 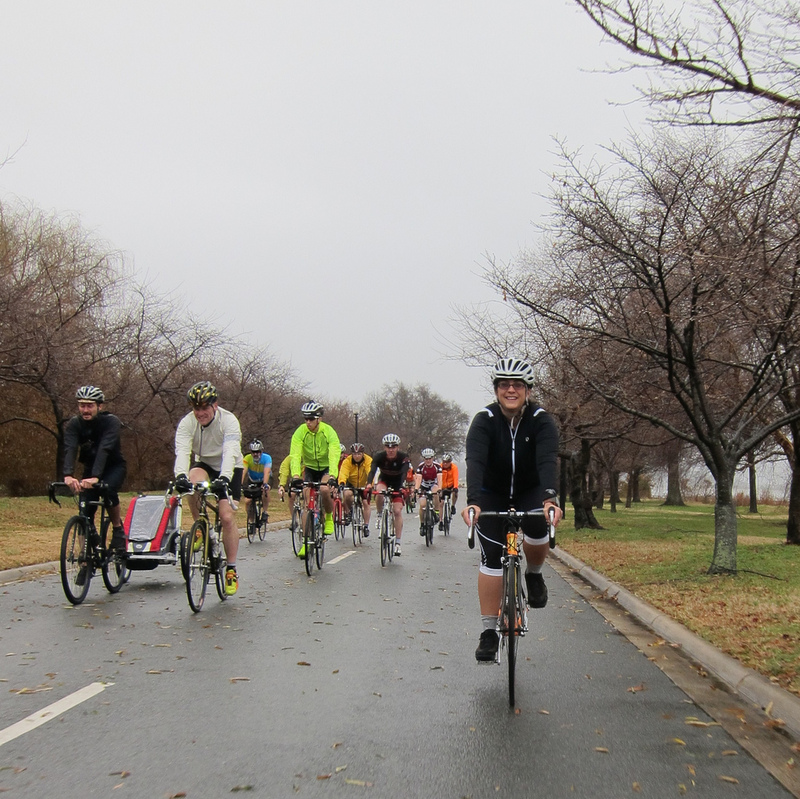 Congratulations to Megan on another successful Hains Point 100 and thank you for inviting us all to be part of it. More pics where these came from. Click here to see my full set from the day. Wow. 100miles made up of 3.4mile loops. That’d be a challenge alright. But also fun. Yes, the potential monotony of the ride is tempered by the fellowship of the whole event. I think you’re good. Next time I see you I would like to review your doctor’s note, though. 🙂 Missed seeing you out there! It was a pleasure riding with you guys, as always! Agree! Thanks for making it a great day! There is –SOON!– another chance to do a “Hains Pt. ” on the traditional date of New Year’s. The Potomac Pedalers once called it “The Most Boring Century of the East”, and now –more aptly & happily– “The Circle of Cycles”.